(Nanowerk News) European funding agencies for astroparticle physics celebrate today the successful work of the ASPERA European funded network and the launch of the newly founded APPEC, the Astroparticle Physics European Consortium. Over the last six years, ASPERA brought together funding agencies and the physics community to set up coordination for astroparticle physics at the European level. The main achievement of ASPERA is the development of the European strategy for astroparticle physics defining the priority large infrastructures needed to solve some of the deepest mysteries of the Universe. ASPERA also developed activities stimulating the field such as R&D common calls and created closer relationships to Industry and other research fields. 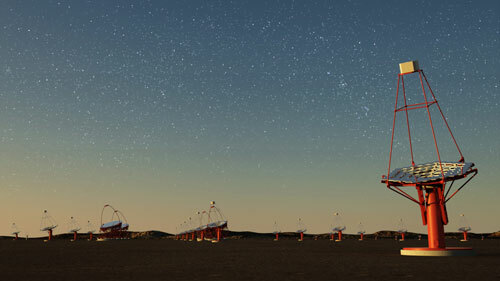 Artistic view of CTA, the ground Cherenkov Telescope Array –priority project in the gamma ray astrophysics area. APPEC will now take over and aims at developing a European common action plan to fund the upcoming large astroparticle physics infrastructures as defined in the ASPERA Roadmap. 10 countries already joined the new APPEC consortium and 9 additional countries are following the accession process. APPEC’s activities will be organised through three functional centers located at DESY in Hamburg - Germany, APC laboratory of CNRS/CEA in Paris – France and INFN national underground laboratory in Gran Sasso – Italy. The meeting was the opportunity for the very first General Assembly of APPEC during which Stavros Katsanevas from CNRS – France was elected as its Chairman, and Thomas Berghoefer from DESY – Germany was elected as its General Secretary. “I’m very honored to have been elected to chair the new APPEC consortium. APPEC’s focus will be to enhance European collaboration and coordination in funding to strengthen astroparticle physics in Europe and keep the leading role of Europe in understanding the secrets of the Universe”, Stavros Katsanevas said. “ASPERA was really a great success leading to the new APPEC structure. Implementing our large astroparticle physics infrastructures is a big challenge and it is a very good sign that 10 countries already joined to make a bright future possible.” Thomas Berghoefer said. What is the nature of dark matter and of dark energy? Where do cosmic rays come from? What is the view of the sky at extreme energies? What is the role of neutrinos in cosmic evolution? Can we detect gravitational waves? To answer such kinds of questions, astroparticle physics develops specially designed particle detectors, telescopes and experiments at the frontier of astrophysics, particle physics and cosmology.